Family and farming have always been closely interlocked. Up till 2003 wine growing was part of the mixed farming of Josef and Elisabeth Wiedeck, who still support us with fresh produce und their work. 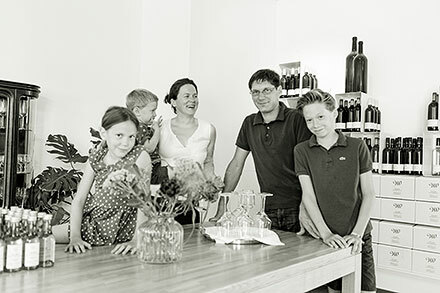 Then we – Johannes & Andrea Wiedeck – planted vines in the 4 acre vineyard "Kleines Thal", thus founding our own wine estate. Also that year Johannes was born, and there was a big wedding. In 2004 more vines were planted, and we started building our own home and buildings for the wine press, cellar, storage facilities and guest rooms. When we moved in in 2007, there were four of us: Maria Theresia was born in June that year. In 2013 Florian came into the world.